VA hospital delays: Still happening. 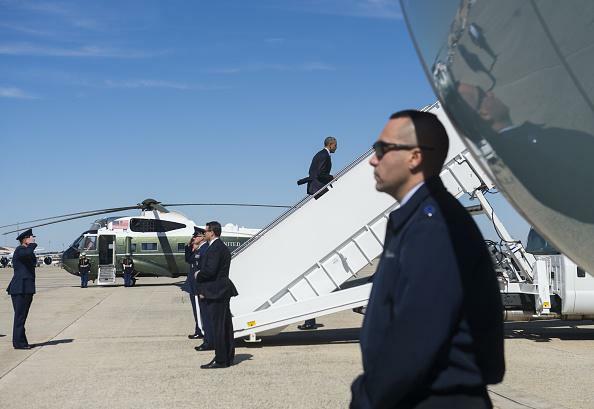 President Obama departing Andrews Air Force Base for a March trip that included a visit to Phoenix’s VA hospital. No one expected that the VA mess could be fixed overnight. But The Associated Press has found that since the summer, the number of vets waiting more than 30 or 60 days for non-emergency care has largely stayed flat. The number of medical appointments that take longer than 90 days to complete has nearly doubled. The most problematic facilities, the AP says, tend to be in rural areas with heavy military presences—Tennessee, Kentucky, North Carolina, southeastern Virginia, Georgia, Alabama, north Florida, southern Colorado, and northern New Mexico. Slate’s Josh Voorhees covered new VA chief Robert McDonald’s reforms in November 2014, writing that congressional demands for high-profile firings fail to address the system’s serious understafffing problems; McDonald has said he would like to hire “as many as 28,000 doctors, nurses, and other additional medical staff.” The AP reports that “800 physicians and nearly 2,000 nurses” were hired between April and December 2014.